A Flamenco guitar, an electric guitar, some percussions and an electric bass. The result is the group Mixtolobo. Two of them, Juan Diego Mateos and Jorge Gómez, present the first record result of this music symbiosis: the title is frontera. 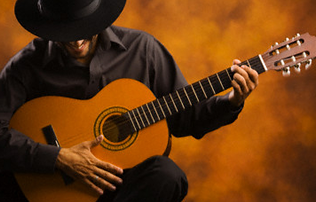 Rock’n’roll and flamenco are joined in Frontera, a fusion that is hopping mad. This fabulous disc is produced by Los Delinquentes. Cai, legendary musical rock group from Andalusia with Light Metaphors that evokes an unique musical style, that marked a period in the Spanish music. Inspiración y Locura (Inspiration and Madness) is the first record by Pata Negra without Raimundo Amador. His brother Rafael is left as the band's only member, with whom other musicians cooperate.